Model Introduction: Generates a spark at a high voltage and frequency, used to detect pinholes and vacuum leaks. Designed for heavy duty use, with a metal power control unit source which separates the input circuits from the high voltage coil in the handle, providing cooler operation, for longer intervals of use It The control circuit is electronic which also affords more precise voltage control. This lends itself to calibration when the application calls for it. Accessory electrodes included are the 12101 Blunt Tip, the 12131 12 in wide T-Tip, and the 12141 Fan Tip. Key Features and Operating Characteristics: It has a 7-position high voltage control switch, which is part on an electronic circuit, making its output more precise and repeatable. Circuitry is fused with ON/OFF switch, and isolating transformer for added safety protection. The metal control unit has a carrying handle and non-skid rubber feet. 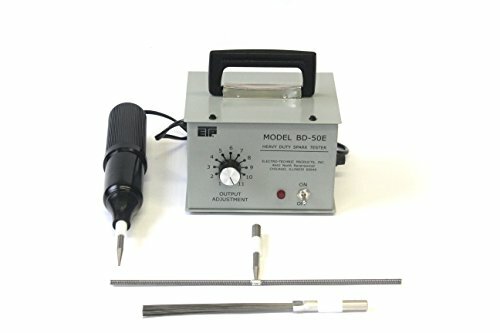 The High Voltage Probe is made of durable plastic, with a 6 ft. cord. A certificate of calibration is optional, furnished upon request. Output voltage is adjustable from 20,000 to 50,000 in 11 steps.Output frequency is 500 kHz. Output current is approximately 0. 1 mA maximum.